October is a pumpkin harvesting month, and also a time for making delicious amber-color pumpkin dishes, like cream-soups and pies. And the Halloween is coming very soon! I love this time of the year, I believe autumn is the most beautiful season. Well, Emirati autumn is different, but let me pretend that it’s autumn here. 😀 It’s raining outside, and golden, brown and flame-colored laves are falling down from trees.. In real the heat is becoming less intense and nature is waiting for the cool season to come. And only one thing is on my mind – baking! This is one of quickest recipes, I swear! 😀 Especially, if you already have puff pastry in your fridge. So, you need cut pumpkin and apples, and saute it in butter, then mix with couscous and roll into puff pastry. That’s it! Since I prefer not very sugary bakes, I make the roll almost not sweet, the sweetness of pumpkin and apples is more than enough here. I slice the ready roll and serve warm with hot tea. 🙂 In case if you want sweeter, add more raisins and brown sugar! Anyway, the roll will be so delicious and comforting! It doesn’t matter what’s the weather outside, when your home is filled with amazing scent of dark brown sugar, cinnamon and baked veggies! I suggest to make own puff pastry, you can keep it in the freezer for several weeks, or if it’s store-bought, be sure that it made from butter not palm oil or margarine! You may vary the quantity of pumpkin and couscous to suit your taste. Cut apple and pumpkin into small cubes, add to the pan with butter, drizzle with lemon juice and saute on medium-high heat for 5-6 minutes. Let the mixture cool. Soak raisins in warm water or cognac for 10 minutes, then drain. In a medium bowl combine pumpkin, apple, raisins with couscous. Add salt, sugar, cinnamon and give it a good stir. Arrange the mixture on the puff pastry sheet. Make the roll, brush it with egg yolk. Bake in preheated 180C/360F oven for 25 minutes. Oct13October 13, 2014 • By milkandbun • This entry was posted in Healthy choice, Pies, Vegetables and tagged apples, autumn pumpkin roll, autumn recipe, baking, cooking, couscous, delicious, Dubai, food, food photo, food photography, food styling, healthy recipe, photography, puff pastry, pumpkin, pumpkin roll, recipes, Russian, vegetables, vegetarian. Bookmark the permalink. Such beautiful autumn colors! Love the combination of pumpkin and apples. Great idea to add couscous here. I’m sure the texture is great. Such amazing colours you’ve got! It’s gorgeous. Fall colors! 🙂 Thank you! Thank you, Ngan! It’s truly delicious recipe, moreover simple to prepare, what can be better? 😉 Hugs! Oooo. I like this ALOT. 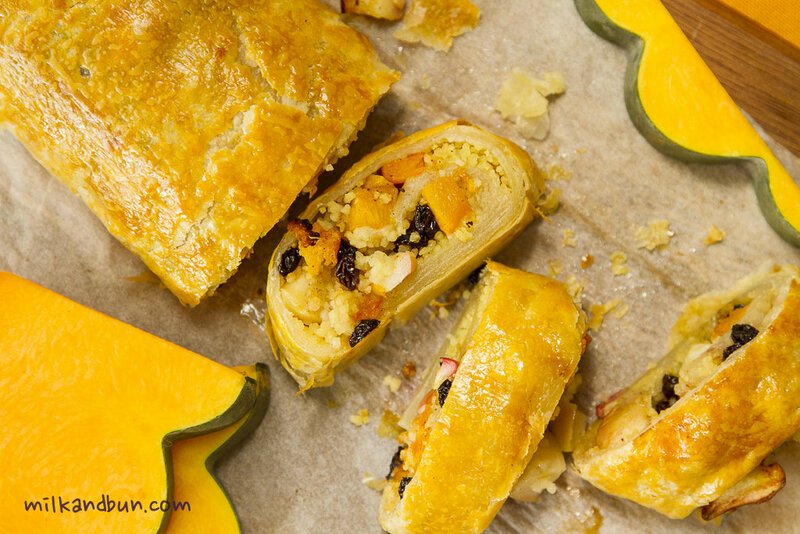 I love using puff pastry and also love pumpkin (or squash). It is so attractive too. This is so beautiful. What great flavor combos. I love fall meals like this. The couscous is such a brilliant idea. Thank you! What a beautiful roll, I love the pumpkin and cous cous and raisins in the filling, It literally screams Fall. Absolutely brilliant. Happy to hear you say all of that! 🙂 Hope, the fall in your area isn’t very cold? How beautiful. Kind of like a strudel, yum! I have strudel recipe also! 😀 Rolls always look tempting, don’t they? It is! 🙂 Thanks for the comment! That’s just superb! Such a creative way to use pumpkin! Thanks, Mimi! The roll tastes really good-not very sweet, just perfect for me:) I use pumpkin a lot, pretty often making cream-soups. Looks gorgeous and delicious Mila! yum 🙂 love how you snuck the couscous in there! One of the easiest recipes! And agree- yummy! Made this and found the flavors wonderful! Since I am a fat American, I added more sugar – but it was great! Thank you for the recipe.